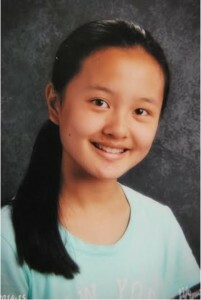 Vivian Zhao is an eighth grader living in the Chicagoland area. She first found the Writing for Peace Young Writers’ Contest while surfing the web. Passionate about reading and writing and everything words from a young age, Vivian decided at the start of elementary school that she would become an author- and it didn’t have to be when she grew up. Besides writing, Vivian plays handbells and the piano- nine years (and counting) of experience with the latter- and is fluent in Chinese as well. Her bucket list includes touring the world, swimming with penguins and of course, good grades. She aims to continue writing for the rest of her life, and hopes that it could become a profession for her too. There is a wealth of original, poetic language in this startling timepiece story, set in 1931, amidst the Japanese invasion of Manchuria. This is a story about the family of a teenage boy, a scholar, ordered to embark on a suicide mission— and the sister who adores him and can’t imagine life without him. The writing is achingly sad but not sentimental; it is colorful, specific, and brutally personal, with lush, visual images of the family seen beneath cherry blossoms. The reader is lured-in and caught, like the boy who is fated to die, and the family watching it happen. Zhao’s winning story will be featured in our 2017 edition of DoveTales, An International Journal of the Arts.